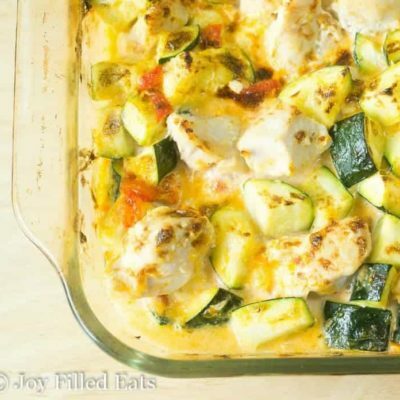 This easy Chicken Zucchini Casserole should be on your next meal plan. 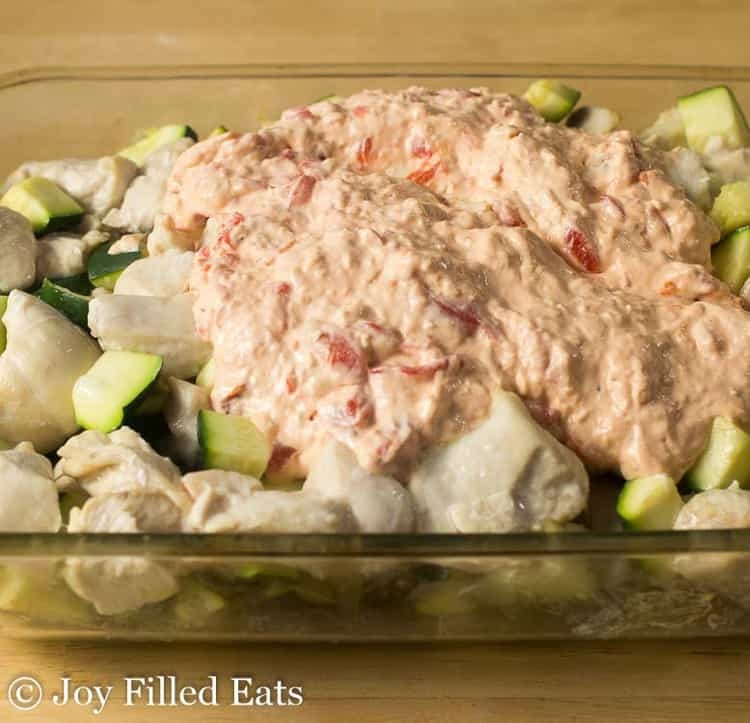 With a creamy sauce full of rich flavors like garlic and roasted red peppers no one will ever know it is healthy. If you’ve followed me for any length of time you probably know that I love casseroles. They are a busy mom’s best friend. Just mix a few ingredients together, pop a dish in the oven, and go about the rest of your tasks while dinner bakes. When your one dish dinner contains both the protein and the vegetable you can feed everyone with minimal cleanup. What I need though is a few lighter casserole options. Don’t get me wrong, I still love cream cheese, bacon, and piles of shredded cheesy goodness but sometimes my tummy needs a meal that isn’t so heavy. This dairy-free casserole is perfect for those days. My trick of the century is using a combination of coconut cream and mayo to get that rich creaminess we all want in a casserole while keeping it dairy-free. I use extra garlic to cover up the coconut flavor and no one even knows it’s there. 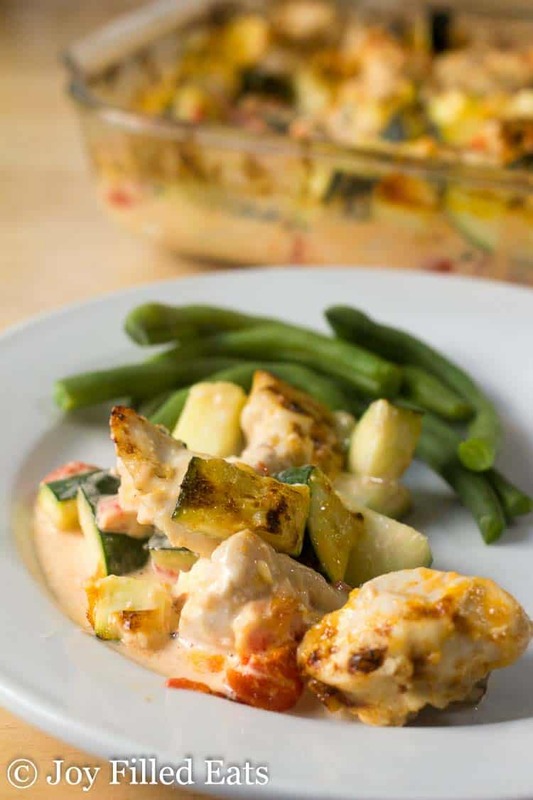 Most of the time I use pre-cooked chicken in my casseroles but I just didn’t have any when I set about to make this one. 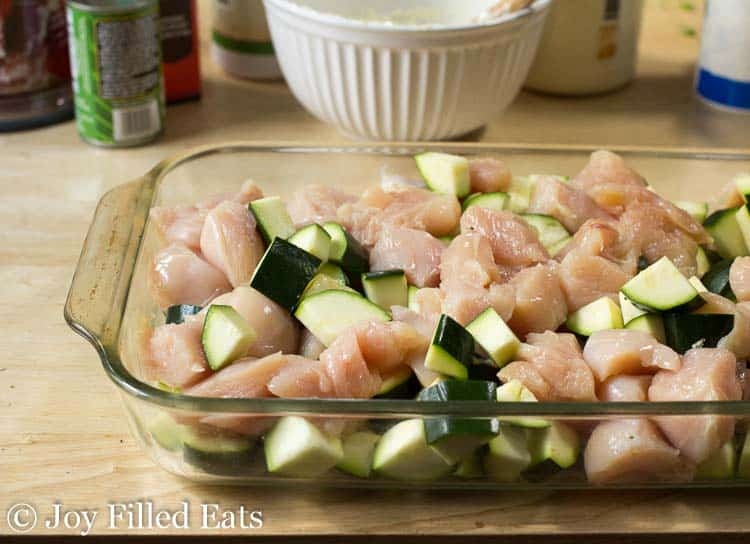 I decided to cube my chicken breasts and cook them with the zucchini to see what would happen. It worked wonderfully! I was afraid the zucchini would get mushy however it was a perfect al dente. Even my husband commented on how ideal the texture was. 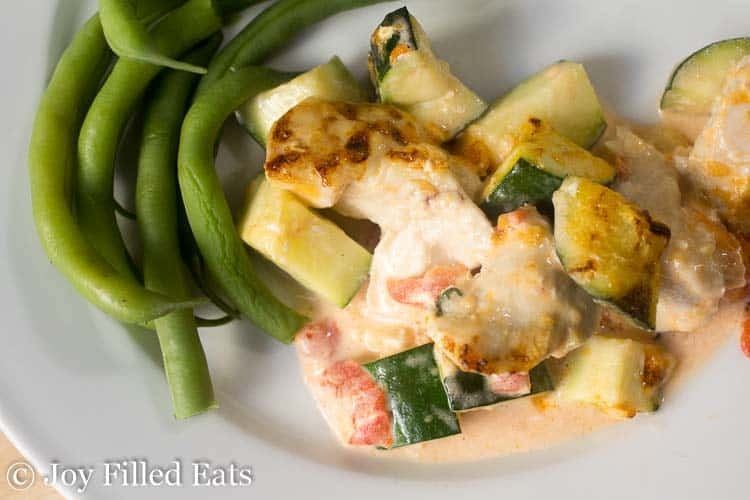 While the chicken and zucchini are baking simply mix together the sauce. As soon as the chicken is 95% cooked through you are ready to add the sauce. Just drain the cooking liquid thoroughly (very important – or you’ll end up with a watery casserole), add the sauce, give it a mix, and pop under the broiler. When I was making this I could not stop tasting the sauce. It is SO good. 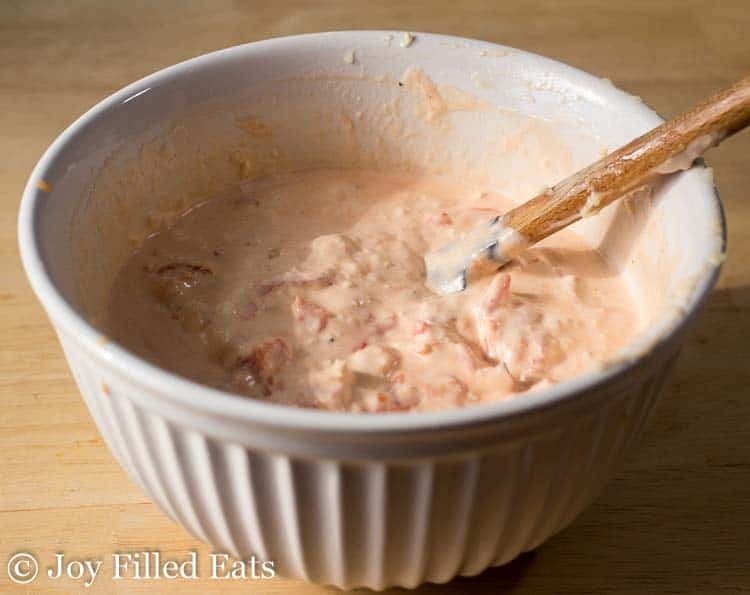 I decided to use the same ingredients and tweak it to make both a Roasted Red Pepper Dip and a Creamy Garlic Salad Dressing. 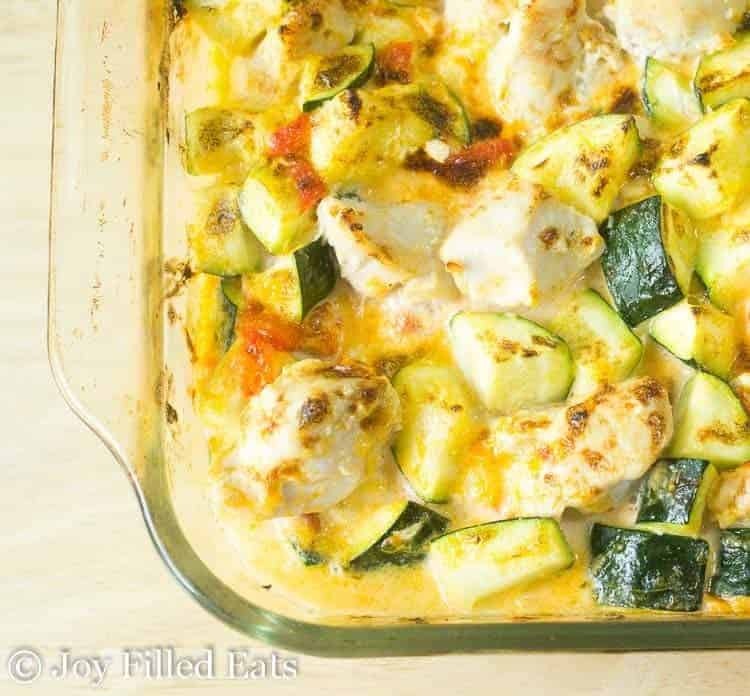 I hope you enjoy this Chicken Zucchini Casserole! 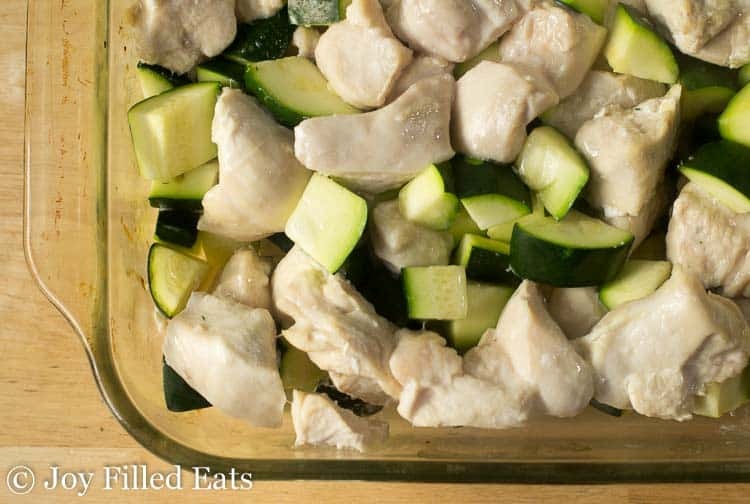 Add the chicken and zucchini to a large casserole dish. Cover with foil. Bake for 25 minutes. Stir. Cook another 10 minutes. Carefully drain the cooking liquid very well. Meanwhile, finely chop the garlic in a food processor, scraping down the sides if needed. Add the rest of the ingredients and pulse until the roasted red peppers are chopped. Cover with the sauce. Broil on high 5-6 minutes. Delicious!! I knew it would be the minute I saw the recipe, simple and fast!! I don’t mind dairy so I used half & half instead of the coconut cream. I guess you could use oat milk creamer, coconut didn’t sound right as a flavor in this dish. I didn’t have tomato paste so a tablespoon of catsup went in. I opted out of the xanthan gum, it can cause some reactions. Didn’t need it Instead of a casserole I used a large cast iron pan and it roasted the chicken and zucchini to perfection as you described the texture and consistency should be. Poured on that beautiful sauce and broiled to perfection! well first of all I must not have pre-heated my oven long enough cuz after 25 min the chicken was still pink so put it back in for another 15 min and then it was perfect. however even after broiling....the zucchini still had some crunch and do not care for that. Is it supposed to taste so coconutty? If I make it again I will add more mayo. The coconut taste overpowered the red pepper. Is the garlic supposed to be minced ? I'm sorry you found it too coconutty. You could use all mayo if you prefer. I was trying to lighten it by mixing it with coconut cream. My family found that the garlic covered up much of the coconut taste. This turned out great! I made the sauce with tomato and artichoke, instead of red pepper. Family loved it. Thanks for making some dairy free recipes. That variation sounds delicious! I'm going to try it that way asap. What can I use if I don't have xanthan gum? Glucomannan would work. Or you can omit it but it helps the sauce thicken. I made this casserole and it was delicious! It was not difficult to prep and the sauce tasted great, especially with the roasted red peppers. Thank you for this recipe! I love dinners like this! Adding it to make must-make list!